Margo DeMello received her Ph.D. in Cultural Anthropology from U.C. Davis in 1995, and currently teaches at Canisius College in the Anthrozoology Masters program. 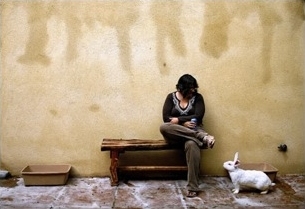 She is the Program Director for Human-Animal Studies at Animals & Society Institute, and the past President of House Rabbit Society. She also volunteers for Harvest Home Animal Sanctuary. Her books include Bodies of Inscription: A Cultural History of the Modern Tattoo Community (Duke University Press 2000), Stories Rabbits Tell: A Natural and Cultural History of a Misunderstood Creature (with Susan Davis, Lantern 2003), Low-Carb Vegetarian (Book Publishing Co. 2004), Why Animals Matter: The Case for Animal Protection (with Erin Williams, Prometheus 2007), The Encyclopedia of Body Adornment (Greenwood 2007), Feet and Footwear (ABC-CLIO 2009), Teaching the Animal: Human-Animal Studies Across the Disciplines (Lantern 2010), Faces Around the World (ABC-CLIO 2012), Animals and Society: An Introduction to Human-Animal Studies (Columbia University Press 2012), Speaking for Animals: Animal Autobiographical Writing (Routledge 2012), Inked (ABC-CLIO 2014), Body Studies: An Introduction (Routledge 2014), and Mourning Animals: Rituals and Practices Surrounding Animal Death (Michigan State 2016). She has had articles published in A Companion to the Anthropology of Bodies/Embodiments (Fran Mascia-Less, ed. ), Human Nature and Self Design (Sebastian Schleidgen, ed. ), Encyclopedia of Human-Animal Relationships (Marc Bekoff, ed. ), Encyclopedia of Animal Rights (Marc Bekoff, ed. ), Encyclopedia of Human Sexuality (Patricia Whelehan and Anne Bolin, eds. ), A Cultural History of Animals: The Modern Age (Randy Malamud, ed. ), Animals in Captivity (Lori Gruen, ed. ), Texts, Animals and Environments (Frederike Middelhoff, ed. ), Animal Biographies: Reframing Animal Lives (Andre Krebber and Mieke Roscher, eds. ), Humans and Animals: A Geography of Coexistence (Julie Urbanik and Connie Johnston, eds. ), The Tattoo Project: Commemorative Tattoos, Visual Culture, and the Digital Archive (Deborah Davidson, ed.) and the journals Anthrozoös, Spring: A Journal of Archetype and Culture, Society & Animals, and Nature. She lives in Oregon with a husband, six Chihuahuas, three cats, a parrot, and four house rabbits.